Tim Rollins has spent over the past 30 years convincing people of a different view of what artists can look like, can come from, and that collaborations and teaching are magical vehicles for learning. His and his students’ work has toured the world, landed in collections worldwide, and serves as proof of the power in belief in art, and as a model for powerful teaching. Rollins grew up in rural Maine, went to NYU in the 70s for art school, then graduate school in art education and philosophy at NYU. He was a founding member of Group Material, which was an amazing collaboration of artists dedicated to creating art and exhibitions that increase social awareness. Other Group Material members included Felix Gonzalez-Torres and Doug Ashford, exhibits were often site specific and build board presentations. In the early 80s Rollins began teaching at-risk middle school students in a South Bronx public school. He discovered that his students responded to art the way he taught it – not the way it is usually taught in public schools. He founded the “Art & Knowledge Workshop” with a group of students who called themselves Kids of Survival (K.O.S.). The kids would meet in an abandoned building nearby after school and on weekends to do homework and make art. 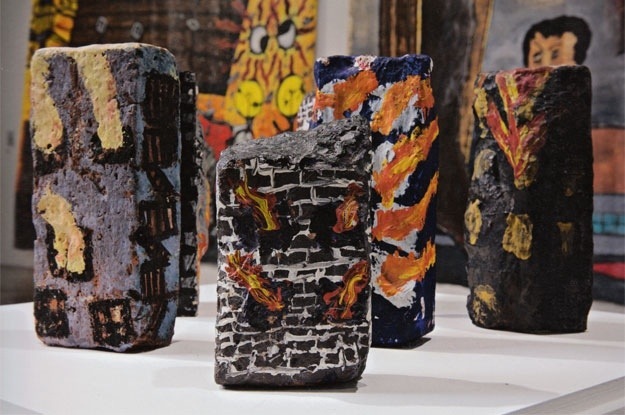 One of his first projects with the kids was to paint bricks – the Bronx at the time had a lot of arson and the children grew up around a panorama of burnt down buildings. The kids painted bricks of burning buildings. Rollins carted the bricks to downtown Manhattan where artist sold their wares – other artists bought the bricks (e.g. Nancy Spero and Leon Golub) for $10 a brick. This likely served as inspiration to make more work that could fuel their group art making practice. Work by Tim Rollins and K.O.S. are now in over 95 museum collections worldwide. They have participated in the Whitney Biennial, Documenta and the Venice Biennale. Some of the most exciting pieces I think are the works on text. Especially the Kafka’s Amerika pieces. Each kid drew an instrument, which was then projected onto a larger canvas that had been covered with the text of the Kafka novel. The result is a gilded and joyful celebration – much like the book is about seeking freedom, so is making art about seeking freedom. In one of his talks recently he criticized the reliance on problems such as ADD determining children’s performance in school. His retort is the problem is “TDD” – teacher deficit disorder. He blames the lack of enthusiasm and commitment to the fact that teachers are burnt out – though he questions if they ever had a flame. While he is not popular on the education conference circuits, he raises a valid point. Indeed Rollins is an outspoken and dynamic speaker, a mark of a great teacher. If you’re curious of his speaking style, on the event of the retrospective at the Frye Museum in Seattle last year, Tim gives a talk overviewing the history of Tim Rollins and K.O.S. The group remains active, had a show in Scotland last year, and did an installation at the Frieze Art fair last year in the Andrew Freedman House in the Bronx. Next month they have an exhibit up in London at the Maureen Paley Gallery. Tagged: Amerika, Andrew Freedman House, Frye Art Museum, Group Material, Kafka, Maureen Paley Gallery, Tim Rollins, Tim Rollins and K.O.S, Tim Rollins K.O.S.